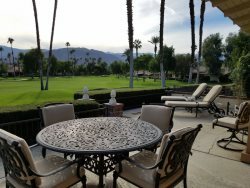 Mission Hills Country Club in Rancho Mirage is a 1,700 acre master planned resort of prestigious custom homes and condominiums. While the country club itself features three 18-hole private golf courses, the convenient Westin Mission Hills Resort offers the championship Pete Dye public golf course. Other amenities include a 55,000 square foot Golf Clubhouse, 29 Tennis Courts (hard, clay and grass), as well as a 17,000 square foot Spa & Sports Center (usage fees may apply). Located about 15 minutes east of downtown Palm Springs and the popular Palm Canyon Drive shopping and dining district and 15 minutes west of El Paseo (the Rodeo Drive of the desert). Enjoy all the amenities at your doorstep, from the numerous golf courses, restaurants, cultural events and attractions. The Westfield Shopping Mall, Cabazon Outlet Mall, The Living Desert Zoo, the McCallum Theater, Palm Springs Tram, Indian Canyons and the Eisenhower Medical Center are just a short drive away; and dont miss shopping for a vacation memento at the popular College of the Deserts weekend Street Fair.